Virtually overnight, the nation's supply of half dimes, dimes, quarters and half dollars vanished from circulation. Bullion brokers, speculators and ordinary citizens plunged into frantic hoarding, followed by the export and melting of vast quantities of silver coins. Nothing was left but the tiny "fish scale" silver three-cent pieces, struck in .750 fine alloy and therefore "melt-proof," even at the increased silver prices. 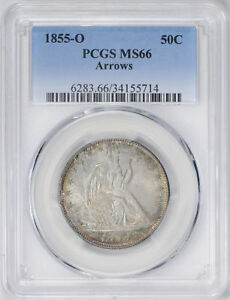 The first lighter weight coins released in 1853 featured arrowheads flanking the date on the obverse and a blaze of raised rays surrounding the eagle on the reverse. This combination was highly visible, but the rays complicated the die makers' work and slowed die production to an unacceptable degree. Dies with the rays also failed much more quickly that the older design, requiring endless preparation of more replacements. 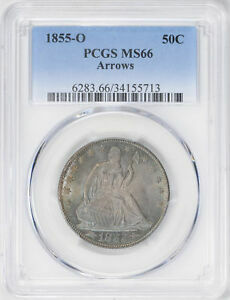 For 1854, the rays were deleted from the quarter and half dollar, creating the Arrows type. This design was struck in 1854 at Philadelphia (no mintmark) and New Orleans (O). In 1855, San Francisco (S) augmented the production of the other two mints. Mintmarks can be found on the reverse, beneath the eagle. A small, but unrecorded number of proofs of both years exist. Perhaps as many as 20 pieces survive of the 1854 coinage, while proofs of 1855 are rarer still, with about a dozen pieces known today. The late Walter Breen recorded three "Branch Mint Proofs" of the 1855-S half, which he believed were struck to celebrate the beginning of silver coinage in San Francisco. One of these, given by San Francisco Mint Superintendent Robert Birdsall to Mint Director James Ross Snowden, later became part of the National Collection at the Smithsonian. The entire question of branch mint proofs is still an area of spirited debate, even among veteran collectors and students of America's 19th century proof coinage. Although high-end, mint state Arrows coins exist in large enough quantities to satisfy collector demand, the same cannot be said for proofs. 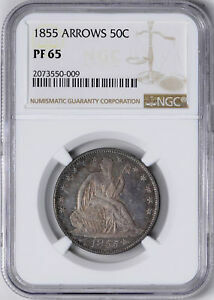 Unfortunately, 19th century collectors did not regard these coins with the same respect shown by their 20th century successors, and handling marks and hairlines are the rule rather than the exception for proofs of this type. When grading this design, or any Seated Liberty half, wear will first show on Liberty's head, breast and knees. On the reverse, check the eagle's head, neck and wing-tops. Beistle, M.L., A Register of Half Dollar Die Varieties and Sub-Varieties, Beistle Co., Shippensburg, PA, 1929. Breen, Walter, A Coiner's Caviar, Walter Breen's Complete Encyclopedia of U.S. and Colonial Proof Coins, 1722-1989, Bowers & Merena, Wolfeboro, NH, 1989. Wiley, Randy and Bugert, Bill, The Complete Guide to Liberty Seated Half Dollars, DLRC Press,Virginia Beach, VA, 1993.